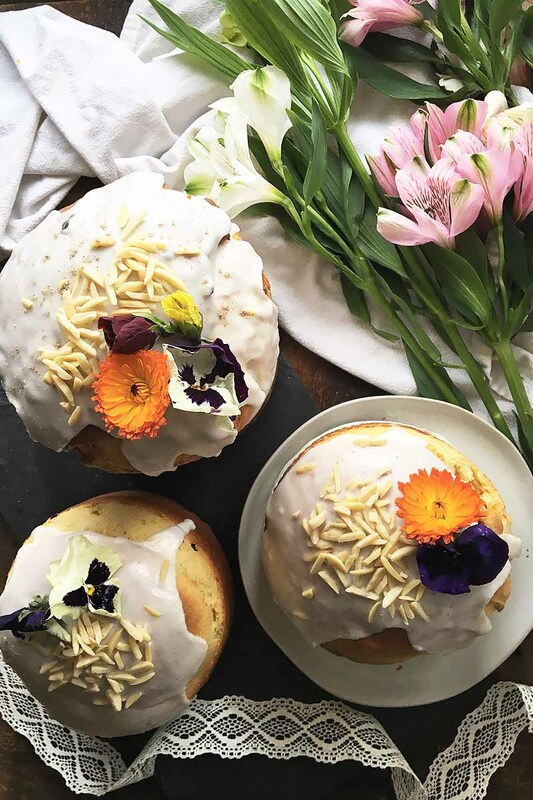 With Easter fast approaching, here’s a recipe for something a little different to try – Kulich, a traditional Easter bread popular in Russia and Eastern Europe. This loaf is semi-sweet, and made with lots of butter and eggs. Once baked, it has a fluffy texture that’s studded with nuts and dried and candied fruits. 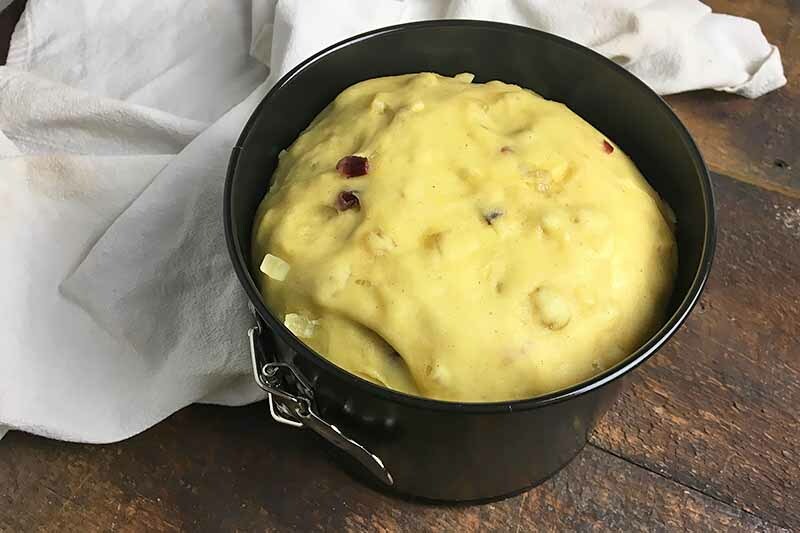 Rich, soft, and delicious, it can be baked in 2-pound coffee cans, in the springform pans used for baking panettone (a sweet Italian bread), or even in those older style enameled steel coffee mugs. 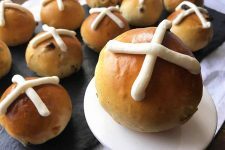 A staple in the Eastern Orthodox tradition, Kulich is usually prepared a few days before Easter. 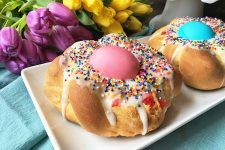 The bread, along with paskha (a molded cottage cheese dessert) and colored Easter eggs, would traditionally be placed in a basket and taken to the parish priest to be blessed before Good Friday. 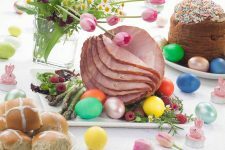 These foods would then be eaten by the entire family, a little each morning until breaking the Lenten fast on Easter. 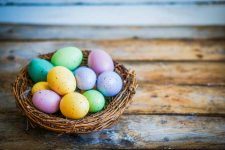 On Easter morning, one of the eggs that had been blessed would be divided among all members of the household, and eaten with the bread and paskha. Each piece was believed to contain a promise of happiness for the coming year. In some regions, other loaves would be presented to the priest in tithing, fed to farm animals for their health and vitality, or placed in a household niche along with icons of the family’s saints. The tasty loaves can be made with or without a glaze, and can have added sprinkles or even chocolate chips on top. 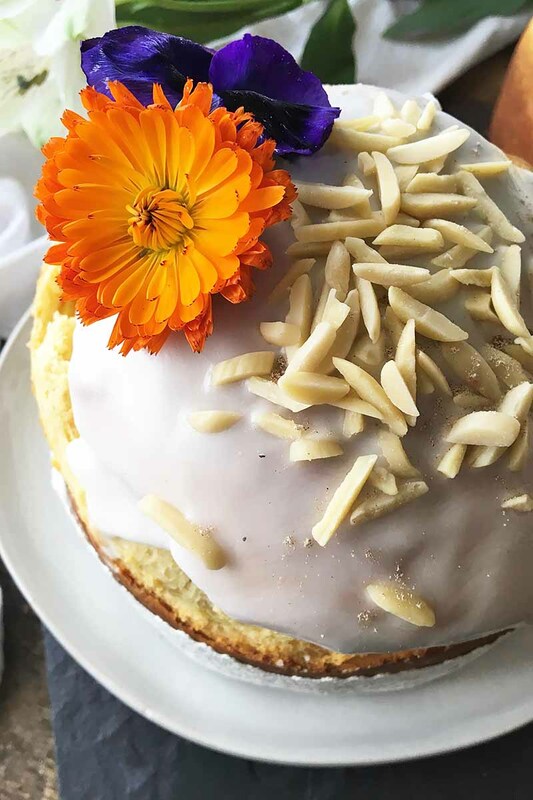 I love the colorful addition of edible flowers for decoration, along with slivered almonds. You can use any assortment of your favorite nuts and dried or candied fruits. Dried apricots, cranberries, and raisins are all lovely. 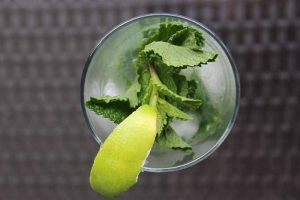 And you can use candied orange or lemon peels for a bright bite of flavor as well. 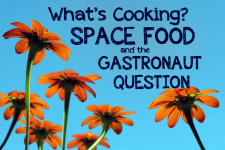 Join us in the spring celebration – make Foodal’s recipe this season! 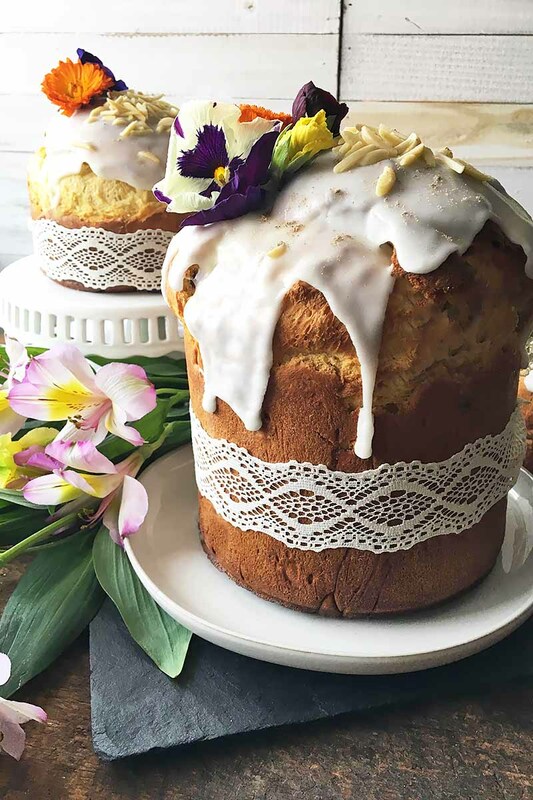 Here’s a sweet recipe to bake as a beautiful centerpiece to your Easter table setting: Kulich, a traditional Russian Easter bread, mixed with fruits, nuts, and a hint of cardamom. 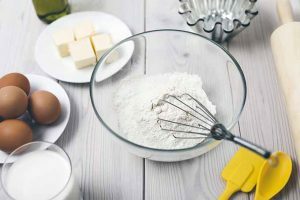 In a large mixing bowl, combine the milk, water, yeast, and 1/4 cup of the sugar with a whisk. Stir until the yeast and sugar have completely dissolved. Mix in 1 cup of flour until well blended. Cover with plastic wrap and let stand in a warm place for 1 hour, or until bubbly and doubled in size. 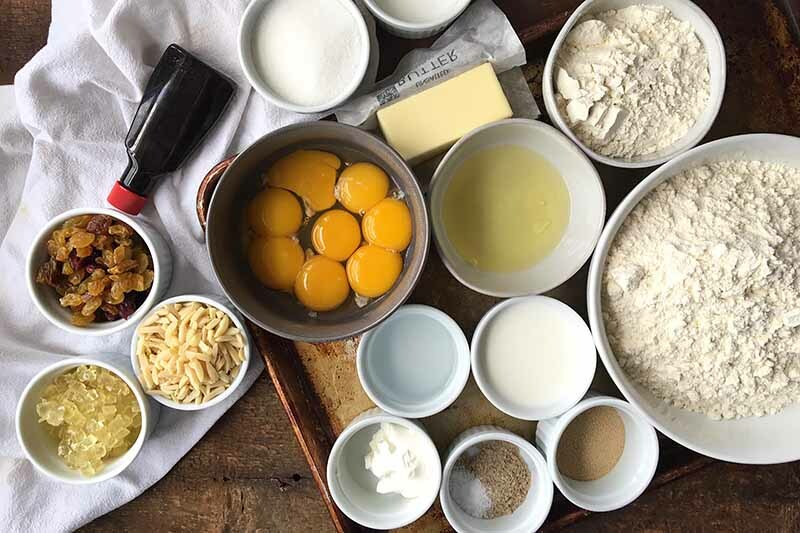 In the bowl of a stand mixer fitted with the paddle attachment, mix together the remaining 1/2 cup sugar, melted butter, egg yolks, sour cream, and vanilla on medium-high speed until combined. Add the risen yeast and flour mixture, and stir well. 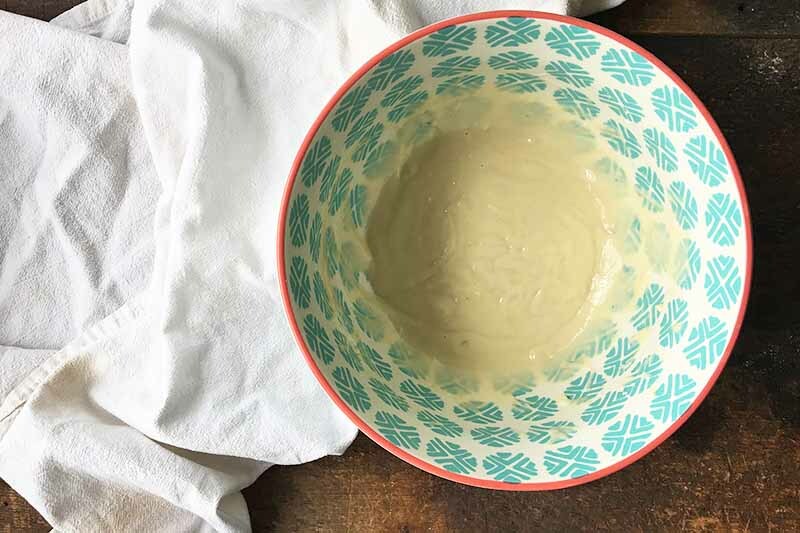 Whisk together the cardamom, salt, and 3 cups flour in a separate small bowl. Add the wet mixture, and mix to make a soft dough. Turn the dough out onto a lightly floured work surface, using the remaining 1/2 cup flour as needed. 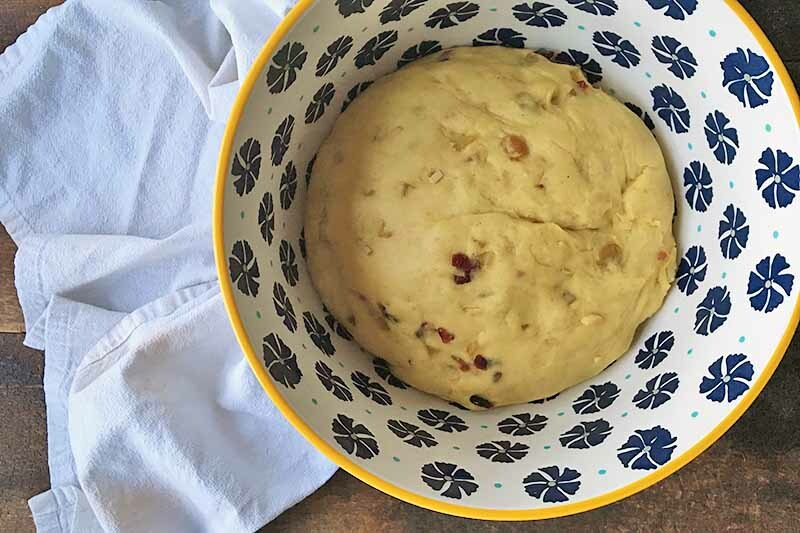 Knead in the raisins, candied fruits, and almonds. Continue to knead for 5-8 minutes, until the dough feels soft and elastic. Alternately, knead in the stand mixer using the dough hook attachment. Knead for the same amount of time, until soft and elastic. Shape into a ball, and place in a large, lightly greased bowl, turning once to coat the entire ball of dough. Cover with plastic wrap and let the dough rise for about 1 hour, or until doubled in size. Punch down dough, kneading a few times. Generously coat a medium-sized springform panettone pan* with cooking spray. Place the dough in the mold. Cover with plastic wrap and let it rise for 1 hour, or until the dough reaches about 3/4 of the way up the inside of the pan. Preheat the oven to 400°F. Put the bread pan on top of a sheet pan, and place in the oven. Bake for 10 minutes. Reduce heat to 350°F. Bake another 35-40 minutes, or until a wooden pick comes out clean. Remove from the oven and let cool for 20 minutes. Remove the bread from the pan and let cool completely on a wire rack. While the loaf is cooling, prepare the icing. 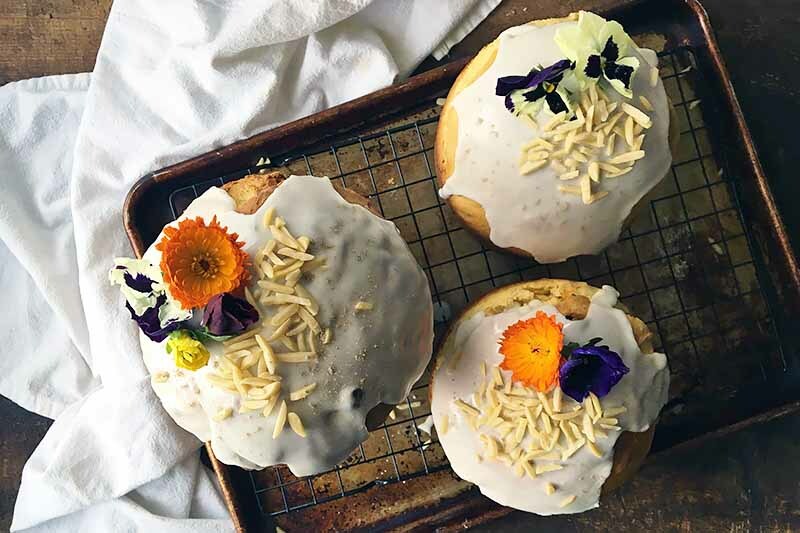 In a small bowl, mix together the confectioners’ sugar, lemon juice, almond extract with enough warm water to make a smooth, thick, and slightly runny glaze. Drizzle the glaze over the top of the cooled bread. Garnish with assorted toppings. Let set until firm. Cut the bread into wedges, and serve! 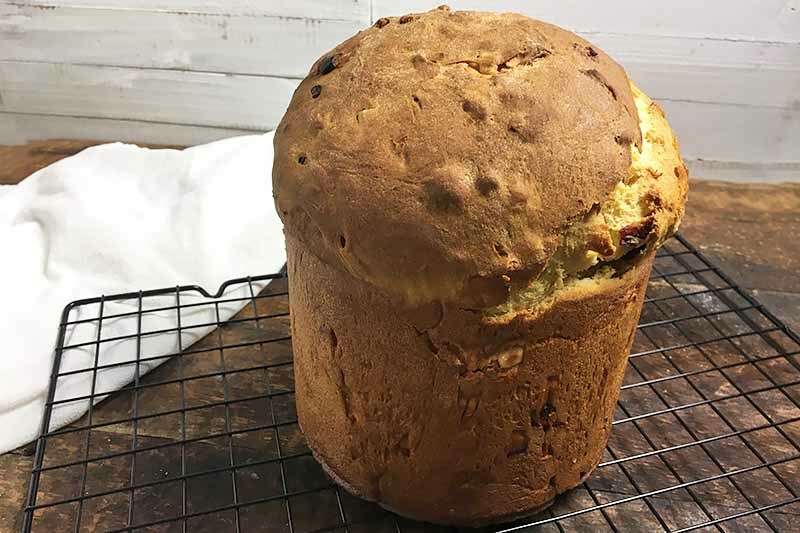 *For this recipe, Foodal recommends using a springform panettone pan that is 4.5 inches in diameter and 6.5 inches in height. You can also use panettone paper molds of close to the same size. Another option is to divide the dough in half and place it in two smaller pans, and reduce the baking time by 15 minutes. of sugar, and 1 cup, 3 cups, and 1/2 cup of flour. Gently warm the milk in the microwave or over the stovetop – don’t let it get too hot, or else it might kill the yeast. Use low heat, and once it comes to a simmer, remove it immediately. Separate the egg yolks from the egg whites. Save the whites for a fun range of recipes, like coconut macaroons and crunchy meringues. Why all the egg yolks and sugar? 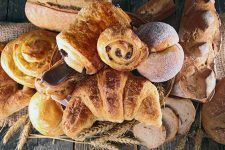 Read all about enriched bread dough, and why this is such a delicious category of baked goodies! In a large mixing bowl, combine the water, milk, yeast, and 1/4 cup of the sugar with a whisk. Stir until the yeast and sugar have completely dissolved. Mix in 1 cup of flour until completely incorporated. The mixture will be very soft and sticky. 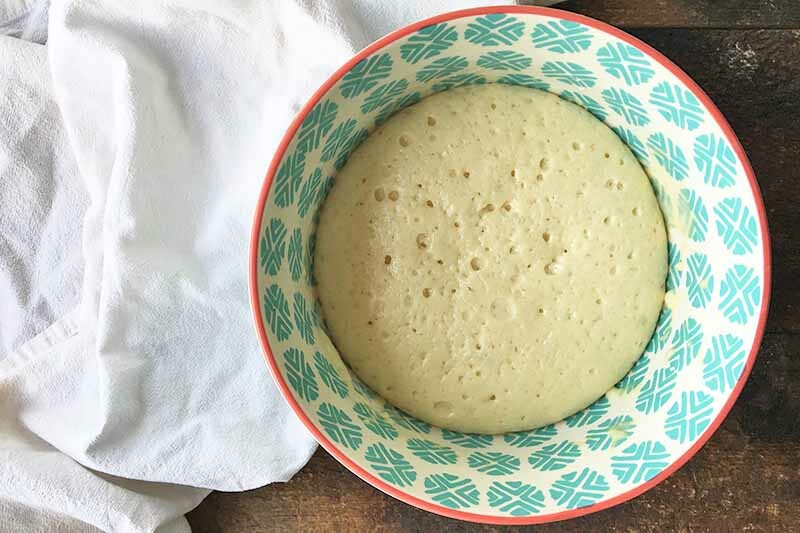 This step helps to jump-start the rising process of the dough. The result? A bread that is extra fluffy and delicious! Use a bowl that is large enough for the yeast mixture to double in size. Cover with plastic wrap and let stand in a warm place for about 1 hour. Melt the butter in a separate bowl in the microwave. 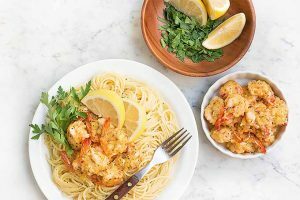 In the bowl of a stand mixer fitted with the paddle attachment, mix together the remaining 1/2 cup sugar, melted unsalted butter, sour cream, egg yolks, and the vanilla extract. Mix on medium-high speed until combined. You can also do this step entirely by hand, using a sturdy spoon to mix everything together before kneading on a work surface. Once the wet ingredients are mixed together, add the risen yeast and flour mixture, and stir well. Whisk together the ground cardamom, salt, and 3 cups flour in small bowl before adding the wet mixture. This step helps to distribute the salt and spice evenly throughout the flour, rather than adding them separately. 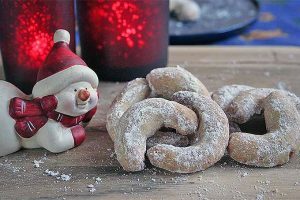 Remember to do this – if added separately, the cardamom and salt may be left in large clumps throughout the thick dough. Once the dry mixture is thoroughly incorporated, turn the dough out onto a lightly floured surface, using the remaining 1/2 cup flour as needed. 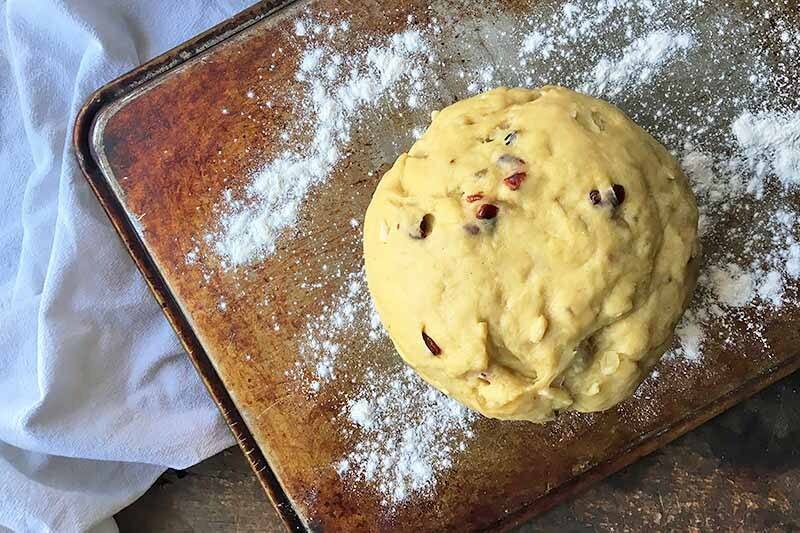 Knead in the raisins, candied fruits, and almonds by hand until thoroughly mixed into the dough. Continue to knead until the dough feels soft and elastic – learn more about gluten development and elasticity, and how it is the backbone of your bread! Too much work to knead the dough all by hand? You can also choose to knead the dough in the stand mixer fitted with the dough hook attachment. 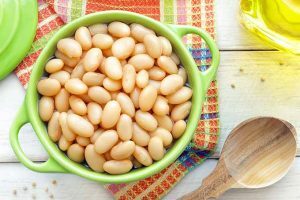 Shape the dough into a large ball, and place in a large, lightly greased bowl, using either cooking spray or any other neutral-flavored vegetable oil. To prevent the dough from drying out, be sure to roll the entire surface of the ball in the oil. Cover with plastic wrap, and let the dough rise in a warm area until doubled in size. This will take about one hour. To speed the rising process slightly, you can choose to place the dough in your oven heated to a very low temperature, no higher than 100°F. Punch down the dough, kneading a few times before forming it into another smooth ball. 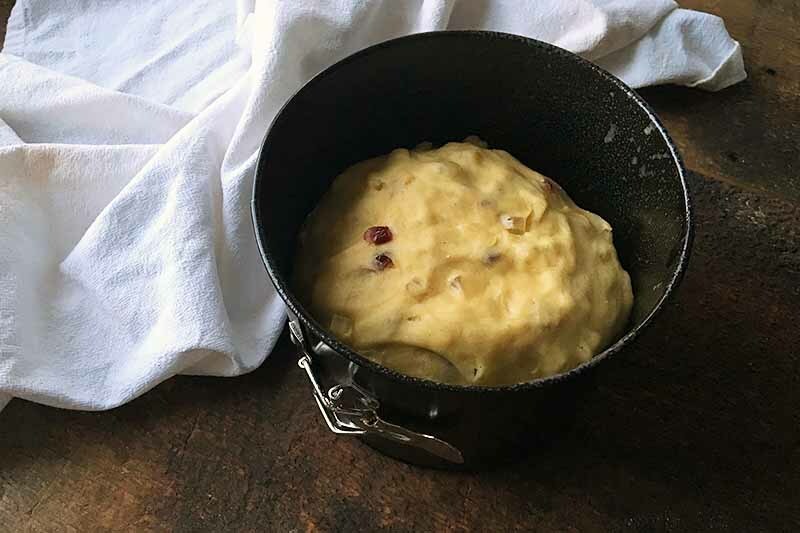 Generously coat a medium-sized springform panettone pan with cooking spray. Place the dough in the mold. Cover with plastic wrap and let it rise for one hour, or until the dough reaches about 3/4 of the way up the inside of the pan. 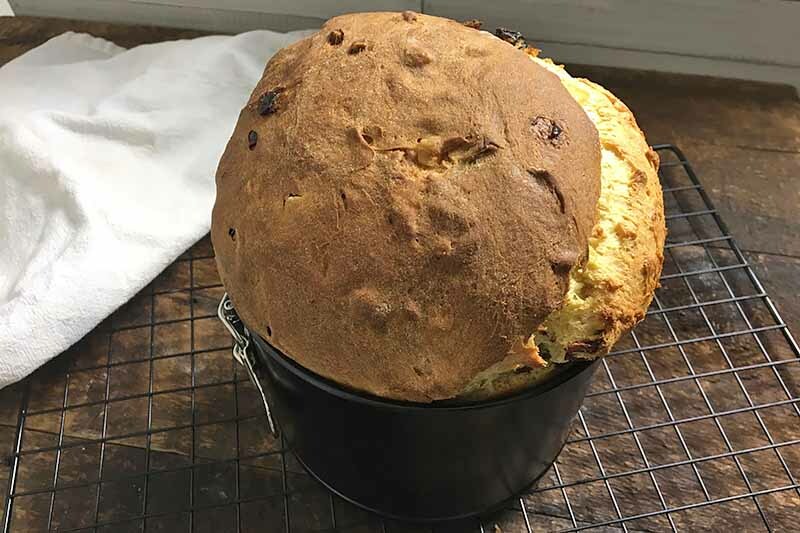 A panettone bread pan is narrow and high – perfect for a gorgeously tall and slender loaf of bread! 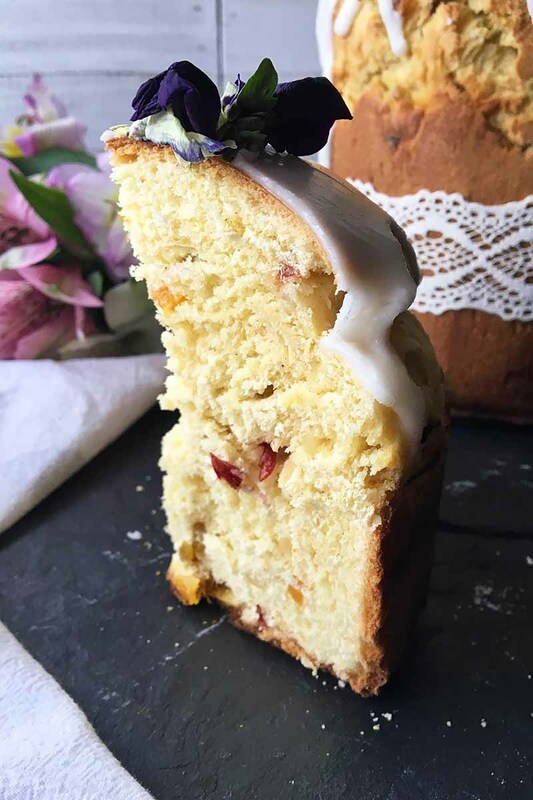 You can choose to use a springform panettone bread pan, or use the upright paper molds specially made for this purpose, of roughly the same size. If you want smaller bread loaves, divide the dough in half. 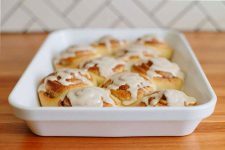 Though you could use the same size pans, we recommend switching to a smaller pan or paper mold to keep the overall shape perfectly high and plump. While the oven is preheating, prepare the dough for its second rise. Cover the pan (or pans) with plastic wrap, and let rise for another hour in a warm place, or until the dough reaches about 3/4 of the way up the inside of the pan. Don’t let it reach any higher than 3/4 of the way up the pan! It will continue to rise as it’s baking – and you don’t want to risk the dough falling down the sides and losing its structure. Skip ahead to the next step if the dough is ready to go. Place the bread pan on a flat sheet pan – this will help you to more easily rotate and remove it from the oven. Bake for 10 minutes, then reduce the heat to 350°F. Bake another 35-40 minutes (25-30 minutes if using smaller pans), rotating halfway through baking, until the top of the bread is thoroughly browned and the dough has risen significantly. Remove from the oven and let cool in the pan for 20 minutes. Remove from the springform pan and place on a wire cooling rack to cool completely. 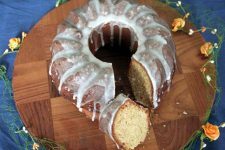 Whisk together the confectioners’ sugar, fresh lemon juice, and almond extract, adding warm water as necessary to make a thick, yet pourable glaze. 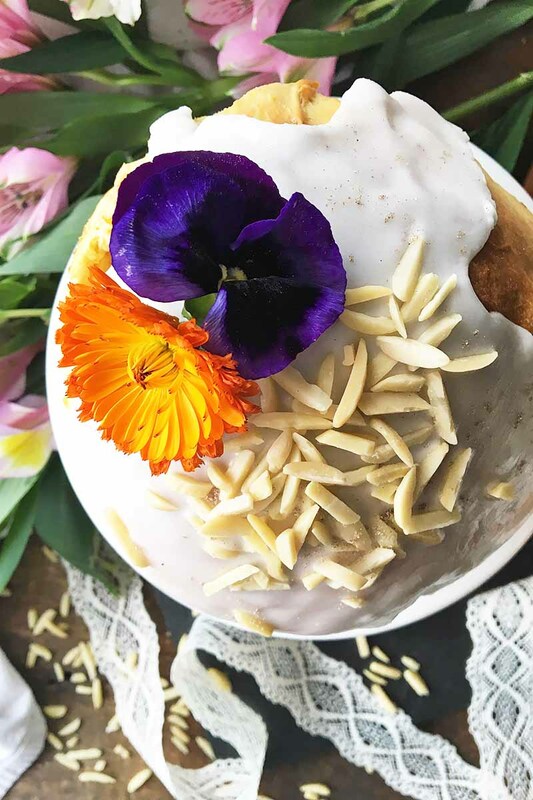 Drizzle the glaze on the top of the cooled bread, and let it set for a few minutes before garnishing with various decorations: slivered almonds, dried fruit, or edible flowers are all beautiful options. Let set at room temperature until firm. Wrap ribbon around the center of the loaf, present to happy friends and family, and serve! 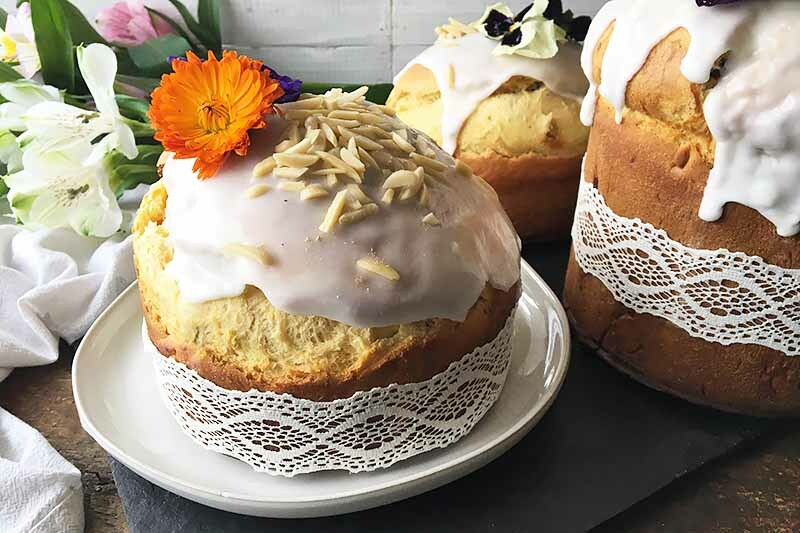 How Should I Serve Kulich? Traditionally, the crown of icing would be cut off, then the bread would be sliced horizontally into wedges, replacing the crown to keep the loaf moist. But do what you wish – a popular method is to cut with a sharp, serrated knife from top to bottom into wedges. 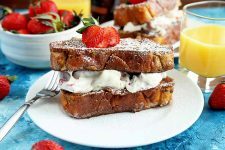 Another alternative is to slice horizontally for scrumptious French toast, or cut the bread up into chunks and make our Raspberry and Chocolate French Toast Casserole, an ideal dish for Easter brunch. This loaf is easy to prepare, but remember to factor in several hours for rising… you’ll be happy you did, as it’s well worth the wait! Photos by Nikki Cervone, © Ask the Experts, LLC. ALL RIGHTS RESERVED. See our TOS for more details. Originally published on March 28, 2015. Last updated: March 24, 2019 at 11:12 am. 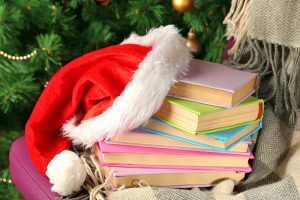 With additional writing and editing by Nikki Cervone. I never even knew they celebrated easter over in Russia. The traditional Kulich looks pretty unique, but THAT FRENCH TOAST is making my mouth water!! My mum loves Russian cuisine so I’ll have to make this and surprise her soon! Let us know how it turns out QueenB… I can’t wait to dig in to some of that French toast myself! 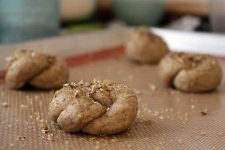 I can remember trying this bread when I was over in Russia one time around Easter and it is great to see a recipe for it. the ground cardamom would explain the flavour of it. I had not remembered that part until now (it was a very long time ago that I had it). I am curious about putting a cup of flour into the yeast mixture whilst activating the yeast though – or is in the first proving of the ‘dough’? But then you are only proving with 1/4 of the flour initially and the 2nd proving with all of it. Curious. The cardamom does give it distinctive flavor Connie, and some versions call for saffron. AS for adding a bit of flour to the yeast, I believe it’s to give gluten production a good start – it’s a process I’ve seen in a number of bread recipes from ‘the old country’. I’ve never heard of this tradition until now. 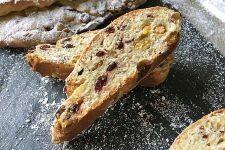 It’s a different take on the usual fruit loaf and the addition of cardamon makes it sound delicious! It’s useful to know you can use the finished product as a compnent of ther recipes too. Cardamom really is a special flavor, isn’t it? And with the cinnamon for the French toast it’s a thing of beauty! 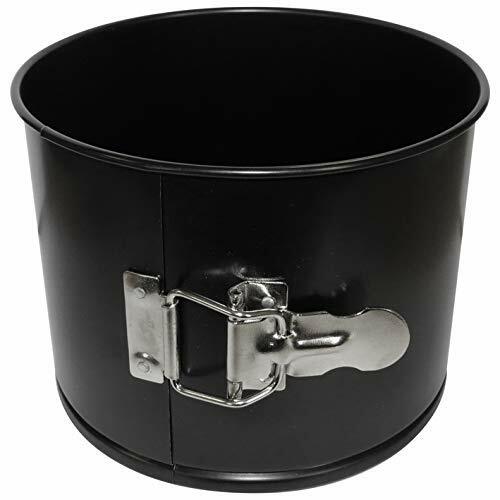 Hi diane, I’ve found plain paper molds for Panettone bread on Amazon, which work well, just search for ‘Panettone paper molds’…. and they’re easily decorated for gift giving. Or, look for the the ornamental ones in a Eastern European market or bakery in your area. Balkan, Ukrainian, Polish, Russian etc. specialty stores should stock them. Oh, good score diane! Thanks for sharing, I’ll have to check them out. This looks yummy! I’m on the look out for good bread recipes that don’t use a bread maker, do y’all are really helping me out with this. I’ve never heard of this bread, but it definitely looks like something I’d like to try. 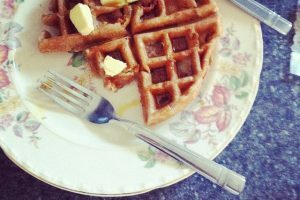 I just wanted to say that the way the history and traditions are in the blogs rather than just the recipes is very refreshing! I love the history lessons almost as much as I do the food. It’s, honestly, part of what keeps me coming back. Thanks for the comments kana_marie, having a little background to the recipes seems to make them a bit more appealing, doesn’t it? 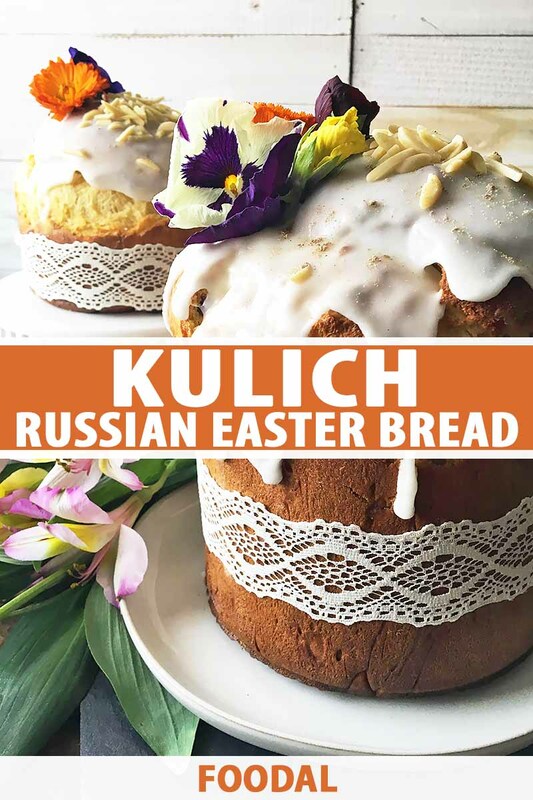 I have never heard of Russian Kulich Easter Bread before, but I am now convinced that I need to try it. 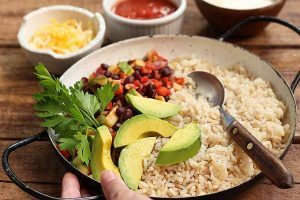 I love trying different foods, and this definitely qualifies as different! I also like the french toast idea! 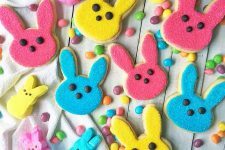 I had already started looking up for Easter recipes because I wanted to make it extra special this year. I honestly thought I was going to have a harder time, but you have made my decision so much easier. 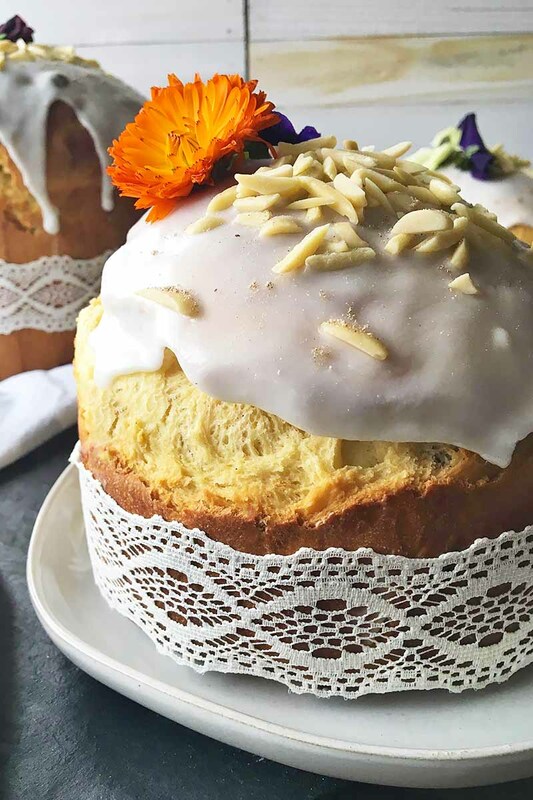 This Kulich looks not only gorgeous but so delicious. I really like its history and the religious tradition behind it. I like that it doesn’t look like I’ll be burning down the kitchen if I try making it LOL. Oh! What totally killed me though was the Kulich French toast recipe you included. One look at the image and I was drooling! LOL. Thanks you for sharing! So glad you find the traditions appealing Michelle, they do seem to add to the recipe. 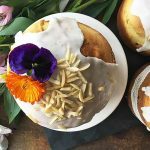 Hope the Kulich, and French toast, add a little special touch to your Easter fare this year! 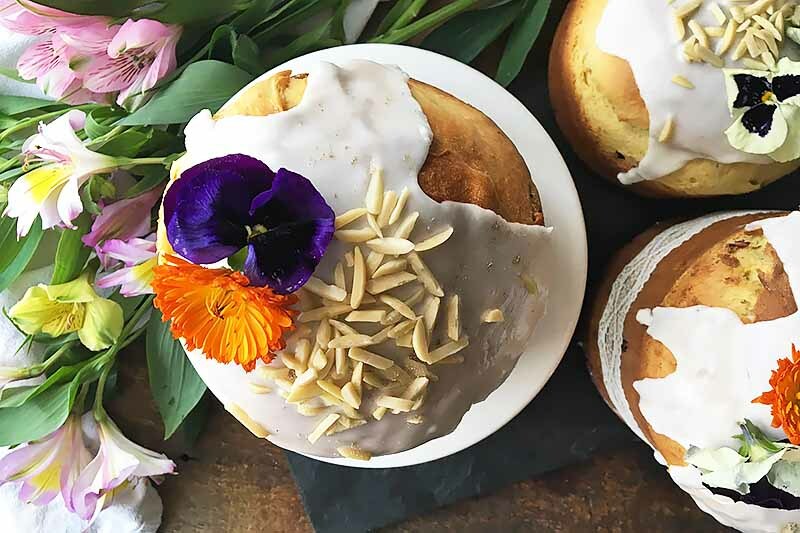 The first picture of Kulich – what beautiful baking papers they are in ! Any idea where they came from?? The decorative ones are a little elusive Maria, but we did find some on an Australian website called Easter Decor (Russian Easter Decorations), and the product name is called Gold Khokhloma, Easter Baking Paper Pans. I also spied some of the fancy ones on various ebay sites, and Amazon has plain ones which are listed as panettone forms as Allison mentioned. If you have a Russian or Ukrainian bakery in your vicinity, that would be a good bet as well. They are lovely, aren’t they? I believe these are paper panettone molds. We haven’t been able to track down exactly where these came from, but decorative papers like these can usually be found at your local baking supply or craft store, or online. We’ll be sure to post an update if we do find them! Best of luck!